Look, your holiday decorations are great. They’re creative, charming, not at all gaudy, and show initiative on your behalf. And that tree! No detail was overlooked. You’ve earned every right to be pleased. Is it perfect? We all know that’s impossible. Perfection is an ideal we can strive for, not something that can be attained. You know what’s something that can get you closer to that goal? 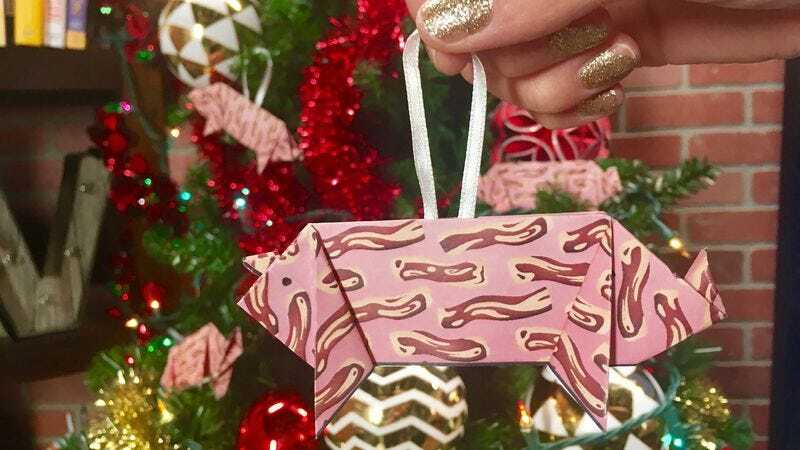 An origami pig ornament. Click here to download, then print and cut out. Follow the instructions, and soon you’ll be the owner of the most talked-about, hippest, eco-friendly ornament on your tree. Others will be jealous. You will be showered with praise. Perfection might never be achievable, but greatness is more desirable. Ask The Salty Waitress: What does it take to get thrown out of a bar?